Most older homes are typically not insulated as good as newer homes are. Sometimes people notice that with an older home their heating and cooling bills are priced higher per month. The good news though, is that nowadays there are different techniques to upgrade your home fast and easy. When considering to update and improve your home insulation you can be sure that you won’t regret it. You will be wondering why you didn’t make the needed adjustments earlier. You will find that it is the best way to maximize comfort and minimize your energy bill. Spray foam insulation is one of the most recommended ways to give your home exactly what it needs. It is necessary that your home has air tight sealed walls which will ensure you to save energy, give you a healthier home, less noise, and fewer pests. Another reason why we should consider using spray foam to update or add to our existing insulation is that it can increase the home value. Buyers love homes that are energy efficient because they know this can help keep their monthly heating and cooling bills stay low. Especially since most older homes that were built before 1960 don’t have very much (if any) insulation. The moment that buyers see the historical home that they’ve been looking for that is energy efficient, you will thank yourself for making the needed improvements. At times using the spray foam could be one of our only options when adding to existing walls. If we are not planning on completely tearing down walls that we would like to insulate- fiberglass that typically come in batts may not be our first option. It is possible to drill small holes and use a pump to fill the space, but it doesn’t ensure that you will create the sufficient amount of density needed to be effective. 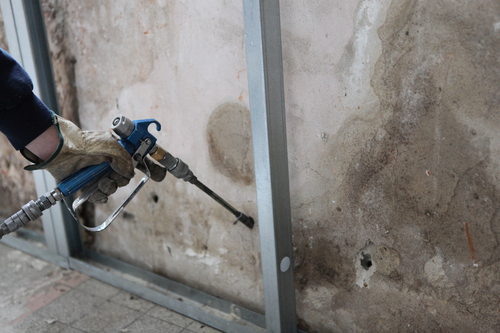 In contrast when we spray with the foam it enters the space, expands in size – causing it to fill any cracks and gaps we have that could cause air leaks, then finally hardens taking its permanent shape. Needless to say updating older homes with spray foam insulation is one of the best things we can do. We have covered just a couple of the benefits in this article and we already see that it is one of the most cost and time effective options. Start living in comfortable affordable temperatures year round. Call us Today & We Can Help!